Now available in a hardcover gift edition Spanning three generations, Muy Bueno offers traditional old-world northern Mexican recipes from grandmother Jeusita's kitchen; comforting south of the border home-style dishes from mother Evangelina; and innovative Latin fusion recipes from daughters Yvette and Veronica. 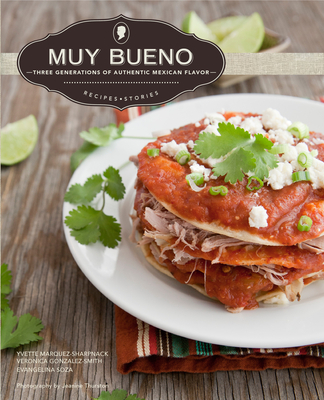 Muy Bueno has become one of the most popular Mexican cookbooks available. This new hardcover edition features a useful guide to Mexican pantry ingredients. Whether you are hosting a casual family gathering or an elegant dinner party, Muy Bueno has the perfect recipes for entertaining with Latin flair You'll find classics like Enchiladas Montadas ("Stacked Enchiladas"); staples like Homemade Tortillas and Toasted Chile de Arbol Salsa; and light seafood appetizers like Shrimp Ceviche and Scallop and Cucumber Cocktail. Don't forget tempting Coconut Flan and daring, dazzling cocktails like Blood Orange Mezcal Margaritas and Persimmon Mojitos. There is truly something in Muy Bueno for every taste This edition features more than 100 easy-to-follow recipes, a glossary of chiles with photos and descriptions of each variety, step-by-step instructions with photos for how to roast chiles, make Red Chile Sauce, and assemble tamales, a rich family history shared through anecdotes, photos, personal tips, and more, and stunning color photography throughout.